It’s a good thing that Precious Ramotswe (The No. 1 Ladies’ Detective Agency, 2001, etc.) has consolidated the No. 1 Ladies’ Detective Agency in anticipation of consolidating her personal life—moving its headquarters back of Tlokweng Road Speedy Motors, the establishment owned by Mr. J.L.B. Matekoni, her fiancé—because the not-so-mean streets of Gaborone are teeming with problems only she can solve. Mr. Molofelo, a prosperous civil engineer from Lobatse, throws himself on her as a confessor, then asks her to find two women he wronged when he was a young man years ago: Tebogo Bathopi, the nursing student whom he insisted have the abortion he made necessary, and Mma Tsolamosese, the landlady whose radio he stole in order to finance the abortion. 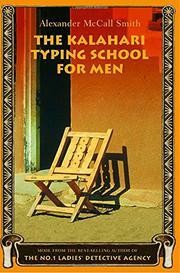 While Mma Ramotswe looks for the women, her assistant, Mma Grace Makutsi, looks for men: if not the gentleman friend she pines for, then prospective students for her new typing school aimed at men who want to learn secretarial skills without embarrassing themselves in front of a classful of women. Bumptious Cephas Buthelezi, who’s opened the rival Satisfaction Guaranteed Detective Agency across town, has no chance against these women’s patient resolve—since although men may be tougher than women, they’re clearly not interested enough in other people to make good detectives. Inspector Ghote meets Mr. Parker Pyne. Readers who haven’t yet discovered Mma Ramotswe will enjoy discovering how her quiet humor, understated observation, and resolutely domestic approach to detection promise to put Botswana on the sleuthing map for good.